With Christmas only seven weeks away (sorry, sorry! ), we're sure households around the country are already dreading the endless mountains of potatoes to be peeled, chopped and mashed into creamy, comforting goodness. Perfect mash is worth a lot of effort, but what if it didn't have to be that way? We have the hack for you. One mother's simple trick for mashed potatoes without the peeling, chopping and boiling has set a comparatively small but vocal online community ablaze with gratitude, suspicion and debate. The method, which saves easily 20 minutes prep time minimum, means that you could have mashed potatoes for your lunch if you wanted - what a world we live in. Writing on the popular mother's forum Mumsnet, the unnamed woman humbly shared her trick, starting "I’m sure I’m not the only person to have figured this out, but before I started doing it, I’d never seen or heard of it". She first cooks her potatoes in the microwave, skins and all, until they're cooked through, which can take between five and eight minutes depending on their size and how strong your microwave is. She then cuts them in half, scoops the fluffy potato out onto a plate and "smush[es]" them with some butter using a fork. At this point, you can add cheese, cream cheese or whatever flavourings you like in your creamy mash. Signing off, the woman jokes that she's waiting "for everyone to tell me Nigella [Lawson] wrote a book about this ten years ago and I never got the memo", though it turns out that Nigella did do a variation on this method to make mashed potatoes for her young kids, baking her spuds first and then scooping and mashing in the same way. Great minds thin alike, right? The trick has sparked awe, delight and a fair amount of debate between mashed potato purists. 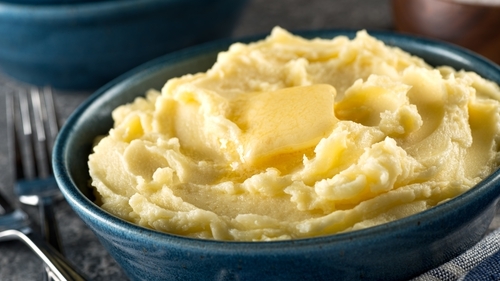 One reader replied that "mashed potato needs to be made from peeled potatoes that are boiled", with the original poster retorting "Nonsense nonsense nonsense. If it’s potato and it’s mashed, then it’s mashed potato". Some argued that the method was actually more labour intensive, not to mention that "removing the skin from a hot spud isn't fun and it does seem to taste like a baked potato even when it is mashed". One commenter simply replied "Mine is frozen mash. Much less labour intensive". Can't argue with that logic. How do you take your mashed potatoes, or are you more about the baked or roasted spuds?